Eichardt's opulent suites invite guests to soak up a sense of quiet before exploring one of the world's truly remarkable locations, Queenstown, in the South Island of New Zealand. Inhale the invigorating alpine air - then step out into the expectant evening and let the lights of Queenstown and canopy of stars guide you to one of the world class restaurants nearby. When winter's blanket descends over the town, the allure of open log fires, coffee aromas and cheery conversation beckon you in from the cold. Eichardt's Hotel reflects contemporary provincial elegance, its modern features in perfect harmony with distinctive antiques and luxurious furnishings of this New Zealand icon. The hotel provides accommodation in five luxurious suites with stunning lake and mountain views. 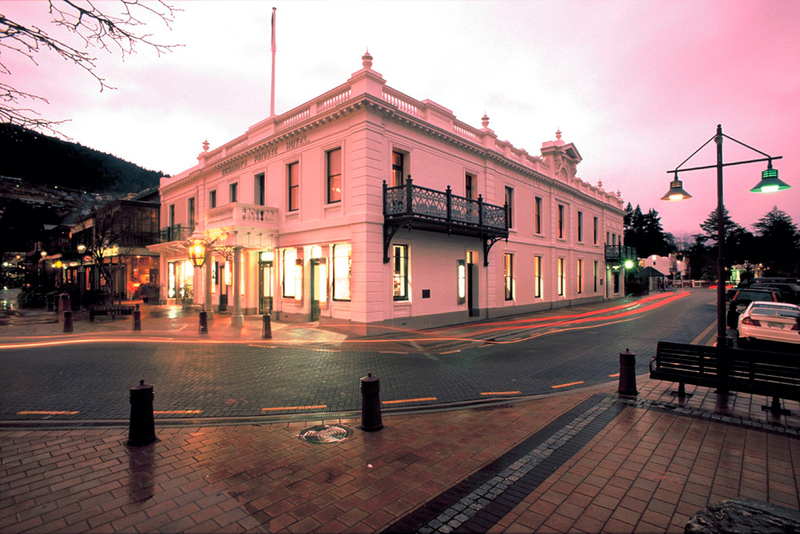 The historic building is in the premium lakefront position at the heart of Queenstown's café and restaurant precinct, with some of the finest international shopping labels an easy stroll away. The rooms all feature a super-king bed, fireplace and mini-bar, a dressing room and bathroom with generous bath and double vanity, separate shower, heated mirror and floor. Each one is fully entertainment and business integrated with personal audiovisual systems, along with email and Internet access. All rooms are generously proportioned and the hotel has ample spaces for privacy and quiet, whether that is reading by an open log fire in The Parlour or enjoying a late morning espresso in The House Bar. Eichardt's sets its own standard for gracious, luxury accommodation with the confident strokes and flawless symmetry of one of New Zealand's leading interior designers, Virginia Fisher. All this beauty and alpine splendour is a world apart, yet right outside is the bright buzz of Queenstown's vibrant café, dining, shopping and nightlife. It has all the facilities and amenities you would expect in a world-class resort. If you want to raft on it, jump out of it, ski over it, float down it, paddle up it, scale it, zoom down it or jetboat in four inches of it, Queenstown has your measure. This is an international adrenaline playground of epic proportions. However, some travellers miss the point about the area - that it is a destination for anyone to find their pace and that there is a great depth to the activities on offer. Here you will find some of the planet's best dry-flyfishing, award-winning wineries, tramping tracks through world heritage-listed national parks, championship golf, therapeutic massage and a choice of two casinos for a roll of the dice. Enhance the restorative powers of the mountains with one of our luxurious health and beauty treatments, have a deep tissue massage in your room or drift through the valley in a hot air balloon. Wander around the corner to see a new release movie, take a thrilling jet boat ride from the pier in front of the hotel. Queenstown has always been home and host to people from many cultures, since the gold rush days when opportunists, adventurers and explorers descended from Europe, China, Australia and the Americas. Dining is a first-class experience in Queenstown, with some of New Zealand's finest chefs bringing together a myriad of taste sensations. The green pastures and sparkling oceans provide extraordinary fresh, organic produce for the distinctive "Pacific Rim" cuisine. Specific culinary styles from almost every culture are also represented. There is also the opportunity to dine outdoors in summer on the lakefront as the sun drops over the jagged mountains, or join welcoming locals and travellers for an apres-ski drink around a crackling log fire on a snappy winter night. Enjoy a lunch of seasonal delicacies and an award-winning pinot noir beneath the vines at a local winery. Eichardt's is only a short walk away from a fantastic range of shops you would normally have to traipse all over a large international city to find. Designer clothing, uniquely New Zealand fashion, specialty accessories, jewellery and some of the world's finest outdoor technical clothing and equipment are all within walking distance. International designer labels mix with some of the most exciting and innovative ideas coming out of the southern hemisphere. The hotel is also close to support facilities and health services. Queenstown is all on your doorstep. The choice is yours and they will assist in making your stay memorable in every way. My wife and I just returned from a wonderful four-week journey to New Zealand. Donna Thomas planned the trip for us. We have been blessed to have traveled quite a bit over the years, and I usually do the planning—but we have struggled to connect with knowledgeable local guides, and New Zealand is a complicated trip to plan; fortunately I found Donna. Working with Donna and her team was a genuine pleasure. She listened to our expectations for the trip and provided valuable advice from the very start of our planning. She has definite, well-founded opinions that helped us to choose among various options, both in terms of where to visit and what to do while we were there.Her impressive knowledge of the country, based on many years of personal experience and development of local contacts throughout NZ helped us plan a great itinerary that met both our budget and our expectations. She was professional, responsive, and meticulous in planning every detail of our trip. We left home feeling well prepared for every aspect of our journey. It was important to Donna to provide a very personalized, first-hand experience of the people of the country she calls her second home. She lodged us in wonderful B&B’s, and connected us with incredible local guides. At each stop on our itinerary we were greeted as if we were old friends. The B&B hosts and the guides clearly hold Donna in high esteem, and seem to treat her clients with extra care.They have obviously have become Donna's friends, but she just as obviously recommended them because they were the right choices for us. We set out on our trip thinking it would be a once-in-a-lifetime experience (so many places to travel; so little time).But we just returned and are already talking about what we will do on our next trip—for which we will most certainly place ourselves in Donna’s capable hands.We recommend her without reservation.